In a business landscape that has become less about the hard sell, maintaining a strong personal brand on social media is fast becoming an essential tool for sales professionals. Social selling—the art of using social networks to locate and build genuine relationships with buyers—can help you gather market insights, warm up leads, build a better buying experience, and ultimately generate sales. Telesmart Communications estimates that by 2020, 85 percent of the buyer-seller interaction will happen online through social media and video, so now is the time to jump in and begin optimizing your online profiles for social selling success. 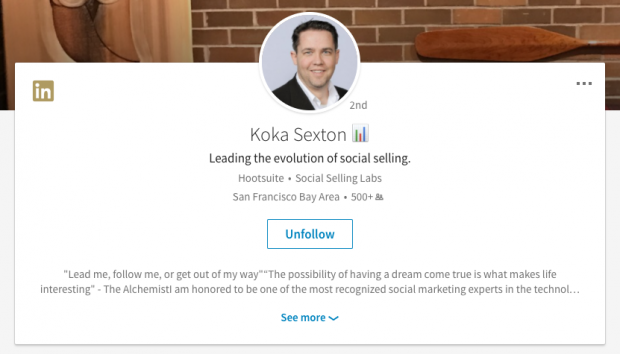 The objective of social selling is to become a more effective sales professional. The magic of it lies in the unprecedented opportunity to “meet” potential customers and influencers. With a growing majority of people heading to social media to form opinions before important buying decisions, it’s more important than ever that you establish a professional social media presence that is polished, up-to-date, and reflective of both your personal and professional goals. But your social media presence doesn’t need to be all business. In fact, being human and sharing personal opinions and interests is what allows you to develop deeper, more well rounded relationships that ultimately build trust with your customers. LinkedIn, Twitter, Facebook, and Instagram are the most commonly used platforms for social selling and the ones we will be focusing on here. However, don’t be afraid to go where your customers are. If your target audience frequents Snapchat or WeChat, make sure you’re represented there as well. A great social profile starts with your username. To project a genuine and professional image, be sure to use your real name to identify yourself and avoid using numbers and underscores whenever possible. Ideally, keep your username the same across all your channels, so that your followers will be able to easily find and recognize you online. Social networks tend to favor profiles that are completely filled out. On LinkedIn, complete profiles are bestowed with “All Star Status,” a benefit that allows your profile to appear above others in LinkedIn search results. This will also help your LinkedIn profile rank higher in a Google search for your name. Make sure to complete all available profile fields to take advantage of these benefits. In addition to adding a profile photo and bio, think about filling out oft overlooked sections like skills and languages spoken. And don’t forget to connect with or follow other users. Since your initial meeting with prospective clients will be digital, it’s key that your online profile photos make a great first impression. Your profile photo should be professional, so avoid excessive editing and filters. Image via Koka Sexton on LinkedIn. This photo is how your potential leads will identify you, which means it needs to be true to life, representing how you usually look when interacting with customers. For example, if you have glasses or a beard, make sure your photo reflects that. 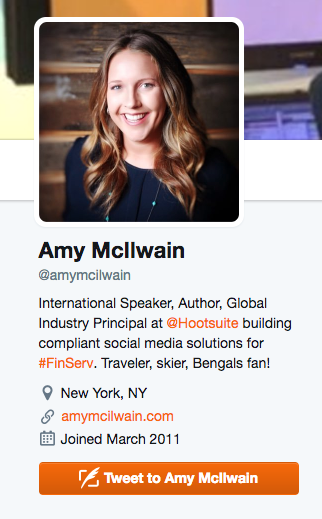 If you normally wear a suit to client meetings, it makes sense to wear one in your profile photo. This will ensure you’re easy to recognize, even when your profile photo is viewed as a thumbnail or on the small screens of mobile devices. All the major social profiles provide an area for you to share a bit about yourself. While the maximum allowed bio does differ by network—from 160 characters on Twitter to 1,500 characters on LinkedIn—there are a few key things to keep in mind when drafting a bio on any network. If you’re starting from scratch, brainstorm a handful of terms that best describe the services you offer, and use them to write a precise, descriptive bio. Keep your bio friendly and relatable by writing in the first person. Remember that the first 140 characters will be visible in search engine results, so aim to cover the most important info early on. On platforms such as Twitter and Instagram, consider adding your company’s social handle or branded hashtag, and include a couple of your hobbies and interests outside of the office to show personality. Image via Amy McIlwain on Twitter. And remember, the key to a great bio on any network is to focus on what you’ve achieved for your customers, rather than what you’ve achieved for yourself. Since the goal of social selling is to generate leads through making genuine connections with your target audience, make sure your followers have ways to reach you. On LinkedIn and Facebook Pages, be sure to include your email address and phone number in your profile details. For platforms like Twitter, consider using the web page section of the profile to link to your LinkedIn profile or personal website, if you have one. Instagram will also allow you to add contact information if you opt to create a business account. On LinkedIn, connections, recommendations, and endorsements can help you establish your position as a thought leader and trusted advisor within your industry. Wondering what the best way to receive these accolades from your connections is? Simple. Give them to get them. Try to make a habit of providing a couple of relevant endorsements to one of your connections every time you log in to LinkedIn. They will be grateful for the endorsements and will likely return the favor. Whenever you do business with, or are introduced to, someone new, send them a personalized invitation to connect on LinkedIn. Personalized invitations are the key to connecting with someone new, particularly if you haven’t met the individual in person. Your invitation should include how you know the person whether it be through a post they wrote or a mutual connection, your honest reason for why you’d like to connect with them, and ideally, something that you both have in common, such as a mutual interest or shared group. Creating a custom URL for your social profiles means it will be even easier for prospects to find your profiles and interact with you online. With a custom URL, you can share a link like www.facebook.com/RyanHolmes instead of something generic and forgettable like www.facebook.com/H1qwefrt32t5g. Facebook and LinkedIn both allow you to choose a custom URL, while Twitter and Instagram default to using your username. As when choosing usernames for your social profiles, we recommend keeping your custom URLs the same across platforms, preferably something simple involving your first and last name. Everyone loves looking at photos and video, so be sure to include some of your favorites on each of your networks. On Twitter, share at least six photos and videos to start, so that your photo gallery—which appears below your bio—is fleshed out, and continue to share photos of important events in both your professional and personal life. Hootsuite’s own Jaime Stein, director of enterprise client strategy, is a master at blending the personal and professional on social media to create an engaging online persona. On Linked In, you can publish Pulse articles, to demonstrate your industry knowledge, showcase your professional successes, and share important career updates. LinkedIn articles are a great place to publish information that you see as relevant to your connections, whether it be your opinions on the latest industry news or a slideshare of a presentation you gave recently. LinkedIn also includes a few additional features that are important to note when optimizing your profile. First, consider LinkedIn’s Activity Broadcast feature, which alerts your network of connections whenever you make an adjustment to your profile. While this feature can be useful for a big announcement, such as a new job title, if you’re planning to make a number of changes to your profile you’ll probably want to turn this feature off temporarily, so as not to annoy your connections with repeated alerts. LinkedIn also allows you to create a custom headline for your profile. While most users assume this headline should be your current job title, savvy networkers know to leverage this field by showcasing the value they provide to their clients. Think of your LinkedIn headline as an answer to the question “so what?” and use the 120 characters provided to showcase your talents while also including keywords important to your industry. Prove your skill using social media to connect with prospects and close more sales. Take our industry-recognized Social Selling Certification course to demonstrate you have the expertise to boost sales results with social media.